This is the time of year when exciting two year olds start popping up like mushrooms after rain. It’s been head spinning stuff these past six weeks, trying to get a handle on several promising juveniles who’ve recorded brilliant wins in NSW and Victoria. Firstly there’s Accession, who has already given his Star Thoroughbreds syndicate of owners a massive thrill, with two wins and a second from three starts. He looked the real deal when he unleashed a big burst to win over 1100 metres at Rosehill on January 19th. Image courtesy Bradley Photographers - Accession and Hugh Bowman in full flight at Rosehill. Brooklyn Hustle created a terrific impression with a spectacular win at Moonee Valley on December 1st last year. The Jason Warren trained filly “bombed” the start from barrier 1, but was still able to win easily after a cool headed ride from Beau Mertens. The Blue Diamond is her mission. There’s the well named Free Of Debt, a son of Unencumbered, who charged down the Flemington straight 1200 to win impressively on January 19th. The South Australian youngster is fast and tractable and wants to be there. Saturday’s Diamond Preview winners could hardly have been more impressive. Anthony Freedman and a big group of owners were thrilled to see their first starter, I Am Immortal, lead throughout to score a dashing win in the colts and geldings’ division. Super sire I Am Invincible also got the winner of the fillies’ division, when Catch Me overcame a wide run to win gamely. Can these brilliant young horses sustain that kind of speed over 1200 metres is the question for racing men to ponder. And what of the blistering win by Dawn Passage in the opener at Randwick - again over the short course. His two trial wins had been pleasing enough, but in the real race he was explosive. It was almost as though he wanted Blake Shinn’s comeback to be a spectacular one. Image courtesy Bradley Photographers - Dawn Passage gives Blake Shinn a dream return to race riding at Randwick 26/01/2019. There was more than normal interest in a Maiden two year old event on the Beaumont track at Newcastle on Saturday. The fact that it was a 1200 metre contest was of some significance, as was the four horse assault launched by Peter and Paul Snowden. James Cummings threw his hat into the ring by starting the Sepoy filly Bollywood who started $3.70 favourite on the strength of an unlucky third at Kembla. The Snowden runners were Howra (Canterbury placegetter), Oslo (2 handy trials), Capitoline Lady (fourth at Gosford previous run) and Shrug (fifth in the same race). To get it into perspective, none of these are in the top bracket of Snowden juveniles and interestingly all four were sent to the paddock this week. David Payne turned up with Peralta, who had run a respectable fourth on the Kensington track at his only run. The Paul Perry trained Pandano was allowed to go out at $6.50 despite two trial wins. First one was at Gosford when the compact colt looked a bit lost, but still got home. He was a different horse in a Wyong trial, when he was unperturbed racing between two other leaders coming to the turn. He took no notice of a very heavy bump from the inside horse and just strolled away to win the trial easily. In Saturday’s race at Newcastle, Pandano displayed the manners of a seasoned racehorse. He flew the gate and was quickly outside the leader, where he came straight back to jockey Bobby El-Issa. He cornered well and was beautifully balanced coming to the 200 metres when Bob pressed the button. I think Pandano let down every bit as quickly as any of the other two year olds we’ve mentioned. The handsome colt put four lengths on his nearest rivals and was easing up on the line with Bob giving him a pat down the neck. 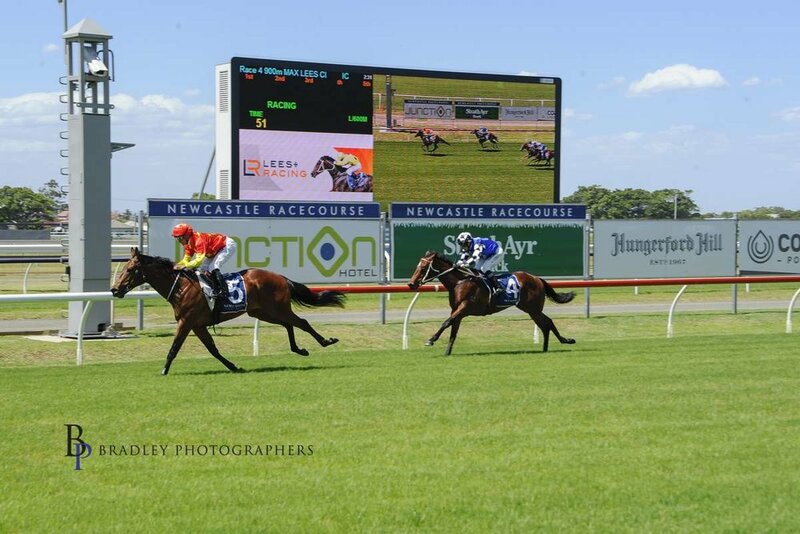 Image courtesy Bradley Photographers - Pandano gives Bobby El-Issa an armchair ride at Newcastle. Trainer Paul Perry who knows a bit about training two year olds, has liked this horse from the moment he set eyes on him. Paul visited Arrowfield Stud to inspect their draft before the 2018 Inglis Classic Yearling Sale and spotted the Dundeel colt in the paddock. “He caught my eye straight away”, recalled the champion trainer. “He had a strong hind end and great shoulders. Everything about him appealed to me”. Pandano was knocked down to Paul Perry for $130,000, but he quickly had enquiries from others. The trainer decided to keep a share, Steve and Louise Gillard secured a share and the Arrowfield Group held on to a quarter - a recommendation in itself. The colt is by former accomplished racehorse Dundeel, who collected 6 Group 1 trophies and was keenly sought by Arrowfield when his racing days were over. Dundeel got his first Group 1 winner when Atyaab won the Cape Derby in South Africa last weekend for Shadwell Stud and trainer Mike De Kock. This was his twenty fifth winner from fifty starters, with three of them at stakes level. Most of the Dundeels seem to be taking a little time. The son of High Chaparral did win a two year old maiden himself, but not until April of 2012 and he was immediately turned out. It’s A Dundeel (as he was known in Australia) won seven of his first eleven starts as a three year old including the Gloaming Stakes, the Spring Champion Stakes, the Randwick Guineas, the Rosehill Guineas and the Australian Derby. He was beaten fair and square by the import Reliable Man in the Queen Elizabeth when he failed to show the dash he had displayed in the Rosehill Guineas and Derby. Image courtesy Bradley Photographers - Pandano returns to scale at Newcastle. Pandano is the fourth foal of Milanesa, who’s by Snitzel out of a Catbird mare. 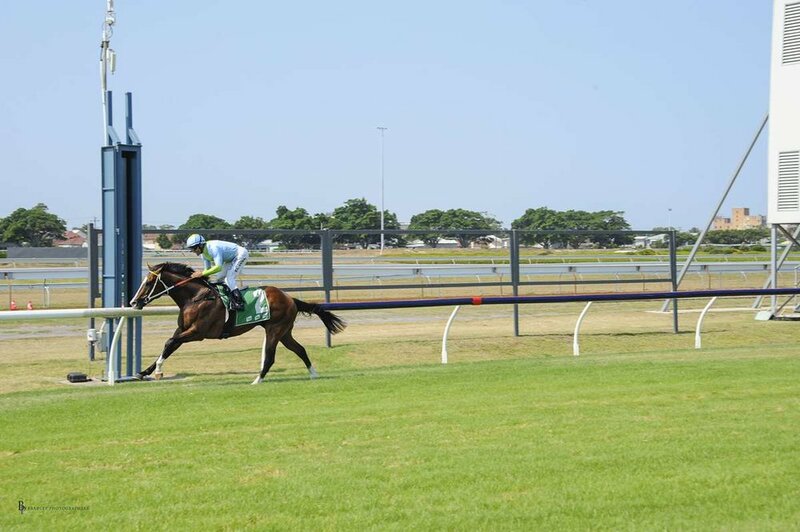 Milanesa raced only seven times for a win in an Eagle Farm two year old maiden and three minor placings. She’d had two to the races before Pandano - Full Throttle who managed to win a Goulburn maiden and Now Or Never who failed to win in five starts, but did finish a close fourth to Satin Slipper in the 2017 Gimcrack Stakes. “Pandano’s dam sire won an Oakleigh Plate and his grand dam is by a Slipper winner”, said Paul Perry. “That’s where he’s getting the speed from”. The two million dollar Inglis Millenium on February 9th has come up too quickly for most trainers with Golden Slipper aspirants, but Paul Perry doesn’t have that problem. “He’s eligible, and he’s doing everything you could ask of him right at this moment”, said Paul over the weekend. “His manners are perfect and he has the turn of foot that suggests he’s a lot better than average. He’ll line up in the Inglis Millenium”. The Inglis Millenium will be run six weeks before the Golden Slipper, making it very difficult for trainers to target both races. It will have great appeal to those connections who believe their two year olds aren’t quite Slipper material. Tony McEvoy took the wraps off another prospect at Sandown on Monday, significantly in a 1200 metre race. She Shao Fly gave the leader Lady Naturaliste four lengths from the top of the straight, but lengthened stride impressively to reel her in. She Shao Fly looked like a filly who might relish 1400 metres in the future. She’s very determined. Let’s not forget Strasbourg, a $750,000 yearling who took a fair bit of ground off Accession at Randwick on December 15th. Two weeks earlier the son of I Am Invincible flew over the Newcastle 900 metres course to win the Max Lees Classic. He’s been in the paddock for a short break and will return to work this week, with the Slipper his immediate goal. Image courtesy Bradley Photographers - Strasbourg (Corey Brown) strolls in the Max Lees Classic at Newcastle. The plot will probably thicken next Saturday when further lead up races will be run in Sydney and Melbourne. The Gr 3 Widden Stakes (fillies) and Gr 3 Canonbury Stakes (colts and geldings) will be part of a strong Rosehill Gardens meeting, while the Gr 3 Chairman’s Stakes will draw a smart field at Caulfield. This is the great mystique of two year old racing. They can appear to be struggling, but suddenly jump out of the ground. They can look dynamic in early trials, but suddenly go to pieces when it’s time to go to the races. They carry the hopes and dreams of owners and they test the mettle of trainers. Many serious punters love the two year old races, because the horses are genuine and good manners often make the difference. For the race fans, the babies put on a spectacular show. It’s a sight to behold when sixteen two year olds face the starter for the running of the Golden Slipper - some of them having their second or third starts. Look below the gates and you’ll see their forelegs stomping and stamping. Listen to the nervous snorting of the adrenaline charged youngsters, as they impatiently await the signal to take flight. I meant no offence years ago when I described the Golden Slipper as “seventy seconds of insanity”.